As a reminder that the winter is still very much in full swing, Bulgaria awoke Tuesday morning buried in snow with the mercury far below zero and numerous reports of electricity blackouts or telephone cuts. The traffic in the Bulgarian capital Sofia is currently impeded, even though the major arteries have been cleaned up. Drivers have been advised to be extra careful because they remain slippery. Pedestrians will not be so lucky - walking through the capital early morning is quite like traversing an untrodden mountain path, for sidewalks still haven't been cleaned. Enormous traffic jams are expected to form in the capital Sofia as well at a number of key roads around the country due to the heavy snowfall. 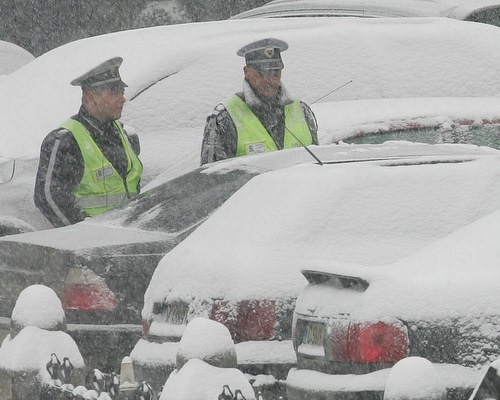 The regions near the northern towns of Razgrad, Shumen and Montana are one of the hardest-hit with cars, trucks and buses stranded in the snow. It is snowing all over the country. The Hemus and Trakia highways are wet and snowy, with some icy patches in exposed areas such as viaducts. The mountain pass from Troyan - Karnare – Elena is closed, with a diversion in operation through Vratnik pass, as is the road between Etropole - Zlatica and Varbitsa - Sungurlare. Trucks with trailers or over 10 tons are banned on the Shipka pass. Similar prohibitions have been applied to the Petrohan pass, the road between Sliven and Ichera, and in the areas of Dospat and Ardino. All vehicles travelling in these areas should be fitted with snow chains. The Bulgarian Mountain Rescue Service has announced there is a high risk of avalanches in all mountain areas, and that skiing or snowboarding outside designated areas is dangerous. Average temperatures for the country will fluctuate between -5C and 3C while for Sofia they will be at about -2C.